The iPhone 6 was not the only iPhone Apple announced today, the company also introduced the even larger Apple iPhone 6 Plus, which is the biggest iPhone the company has made to date. The larger iPhone hopes to meet the ever growing demand of large-screened smartphones, which competitors like Samsung have been cashing in for years. The iPhone 6 Plus comes with an even larger display than the 4.7 inch iPhone 6. The 5.5 inch display on the iPhone 6 Plus has a 1080 x 1920 pixel resolution and a 400 ppi pixel density, which is also referred to as a Retina HD display. 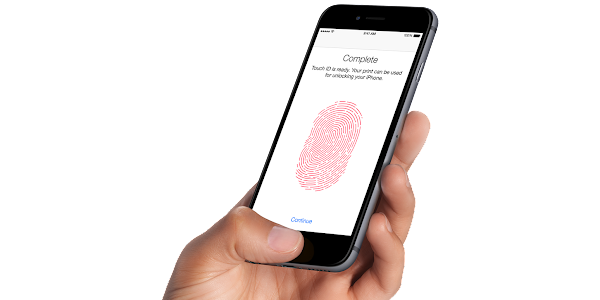 The iPhone 6 display has a brightness of up to 500 nits, and comes with an oleophobic coating that will keep away the fingerprint smudges. But size and resolution aren't everything. The next-generation Retina features an ultra-thin backlight, which has allowed the panel to be made thinner. 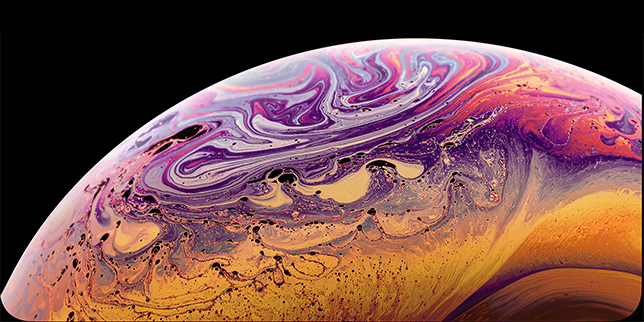 On top of it is layered the photo-aligned IPS liquid crystal, covered by an improved polarizer for even better outdoor visibility. Color accuracy and viewing angles have also been improved on the new screen. 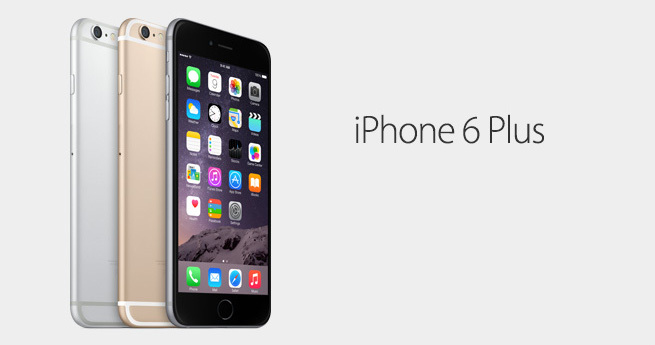 The iPhone 6 Plus comes with dimensions of 158.1 x 77.8 mm (6.22 x 3.06 in) and a weight of 172 grams (6.07 oz). The thickness has shrunk down to 7.1 mm (0.28 in). This means, the iPhone 6 Plus is even thinner than the iPhone 5s despite being so large. 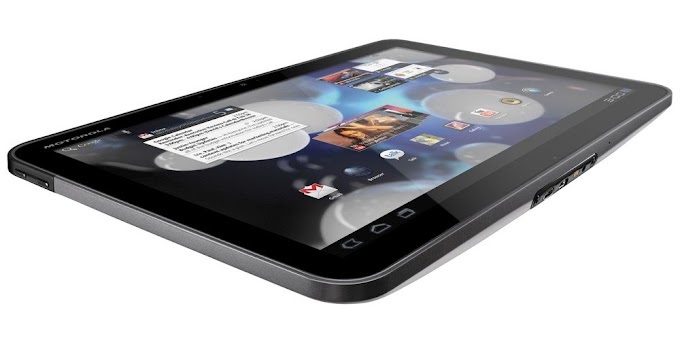 Its glass surface has been ion strengthened to protect it against scratches. The back of the handset is made of anodized aluminum and the logo is crafted of stainless steel, which gives it an outstanding look. 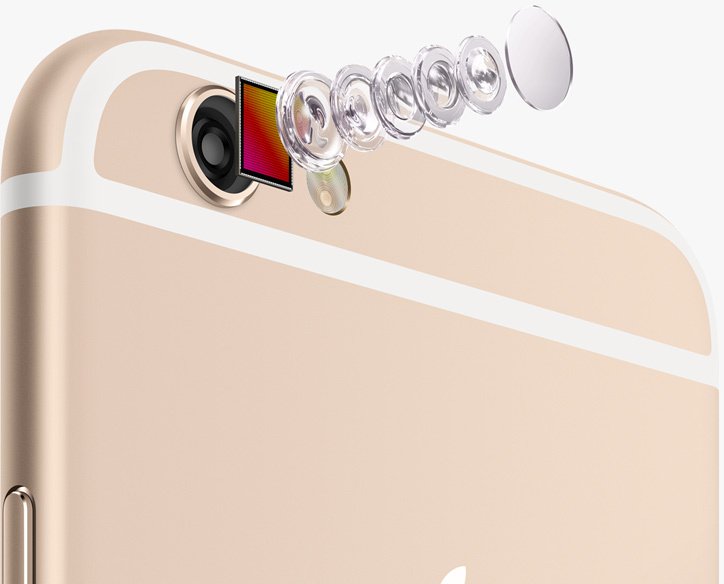 The iPhone 6 Plus comes with an 8 megapixel main camera like its predecessor with a True Tone flash. The unit has 1.5µm pixels, and its five-element lens' aperture sits at f/2.2.Apple also claims that, because the iPhone 6 Plus camera makes use of phase focus, the time needed for the unit to focus will be cut in half. Apple also revealed that the improved snapper can shoot slow-motion in 720p resolution at 240 frames per second in case you feel like 120 frames just weren't enough. The iPhone 6 Plus even includes optical image stabilization (OIS) which works with the A8 chip, gyroscope, and M8 motion coprocessor to measure motion data and provide precise lens movement to compensate for hand shake in lower light. The fusing together of long- and short-exposure images also helps to reduce subject motion. The implementation of OIS should result in beautiful low-light photos. As for the camera at the front, we're looking at a "new" FaceTime HD (720p) camera with an "all-new" sensor with f/2.2 lens. According to Apple, the new config will allow the camera to collect 81% more light for brighter selfies. 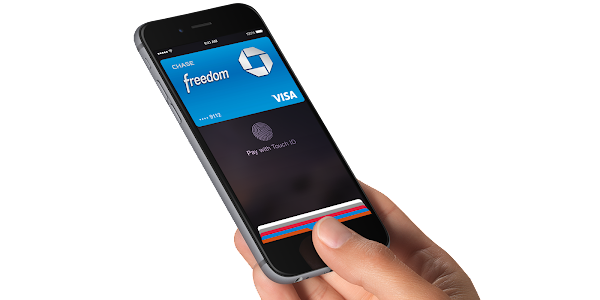 One of the biggest implementation on the new iPhones is Apple Pay, a new way to pay according to Apple. This new feature will be implemented into PassBook and aims to discontinue the wallet, something that the competitors have been struggling to do for years now. Apple pay uses the NFC chip embedded in the iPhone 6 to make payments in a huge list of retail locations including Starbucks, Subway, McDonalds, Macy's, Bloomingdales, Staples, Whole Food Market, and Disney and Apple stores. To achieve that, Apple has also partnered with Visa, Amex, MasterCard, and American Express, the combination of which processes over 80% of all transactions made in the States. While Apple Pay replaces the traditional use of the credit card, it also does this in a far more secure fashion. The way that works is that instead of simply stockpiling on your credit card info and then share it with merchants when transactions occur, Apple Pay will instead generate one-time-only, dynamic security tokens. In other words, as soon as a transaction is complete, even if someone was to somehow get their hands on said token, it'll be less than useless for them. The Apple Pay service will be released for the iPhone 6 and the iPhone 6 Plus in October. The iPhone 6 Plus comes with the same Apple A8 dual-core processor found on the iPhone 6. You get a smaller, 20-nm chipset with 2 billion transistors, all the while being 13% smaller than the A7 silicon on the iPhone 5s. Perhaps most importantly, however, the new chip's two cores will be 25% faster and its GPU will perform 50% better in comparison with the iPhone 5s. The new SoC also comes with support for over 20 LTE bands, which is more than any other phone right now. What's more, the iPhone 6 will also support LTE roaming, Voice Over LTE, and Wi-Fi calling. Speaking of Wi-Fi, Apple is moving to the 802.11ac standard, promising up to three times faster speeds when connected to a wireless network. The secondary M8 coprocessor on your iPhone 6 manages your motion by continuously measures data from the accelerometer, compass, gyroscope, and a new barometer. This offloads work from the A8 chip for improved power efficiency. And now those sensors do even more, measuring your steps, distance, and elevation changes. In terms of storage space, Apple has added a 128GB option to the iPhone 6 Plus lineup. While technically this isn't the first phone to offer such plentiful on-board capacity, it is the first phone from a well-known brand to do so. 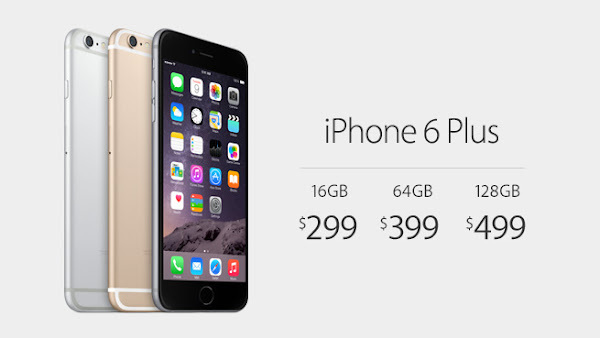 For those who don't require that much space, the iPhone 6 Plus is also available in a 16GB, and 64GB model. More power and features are, of course, only one side to the coin – efficiency is becoming increasingly important. While Apple is yet to reveal the exact capacity of the battery of the iPhone 6 Plus, the larger size obviously allows a larger battery. This results in the larger iPhone offering an even longer battery life than the iPhone 6. While iOS 7 was a huge design overhaul, iOS 8 focusses on functionality. Apple has brought several new features and improvements while opening up the platform to developers. The Messages app on iOS has received a huge update allowing you to send a voice or video message to your contacts. You can share your location, name your group chats, and mute or leave the conversation whenever you like. 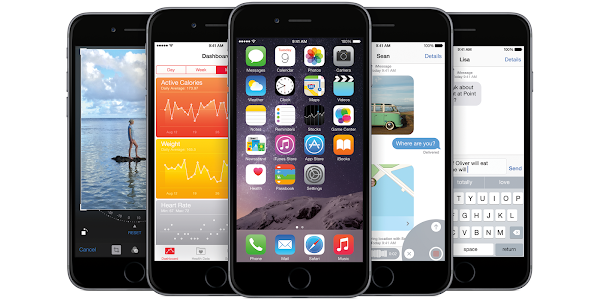 Apple is introducing Health with iOS 8 to manage all your health related information. You get an easy-to-read dashboard and it even connects to other apps or your Apple Watch to manage your fitness and exercise. The new QuickType keyboard is smarter than ever before. You can tap to choose a word suggestion and allow the keyboard to learn from the way you use it and predict what you will say next. Apple is also opening up its keyboard to developers allowing new third party keyboard experiences on iPhones for the first time. The useful new Family Sharing feature allows up to six family members to share purchases from iTunes, iBooks, and the App Store without having to share accounts. With iCloud Drive, you can save all your files including presentations, PDFs images and more. The iCloud Drive will be available for all your iOS devices, Mac and PC. Notifications on iOS are now actionable, which means you can respond to texts, email, calender appointments, reminders and more from your notification banners without opening the apps. Spotlight search has been further improved on iOS 8 allowing you to search beyond your device. You will now get information on your searches from Wikipedia to other trending news and your location and context will be considered to ensure your next in relevant. Last but not least, is the new continuity feature on iOS 8 and OS X Yosemite, which allows your iPhone to be connected seamlessly to your Mac and other iOS devices. You can use the Handoff feature with favorite apps like Mail, Safari, Pages, Numbers, Keynote, Maps, and more. Answer calls on your Mac or iPad. Send photo, video, or text messages from any of your devices. And use your iPhone as an instant Wi‑Fi hotspot. All these features combined with updated versions of iOS apps you know and love to ensure you have the best iOS experience to date with iOS 8. You can learn more about iOS 8 below. The larger screen on the iPhone 6 Plus has allowed Apple to introduce a feature previously limited to the iPad - landscape mode. With iOS 8, the iPhone 6 Plus will take advantage of all that screen real estate, allowing you to use it in landscape mode in more places than ever, even in the home screen. 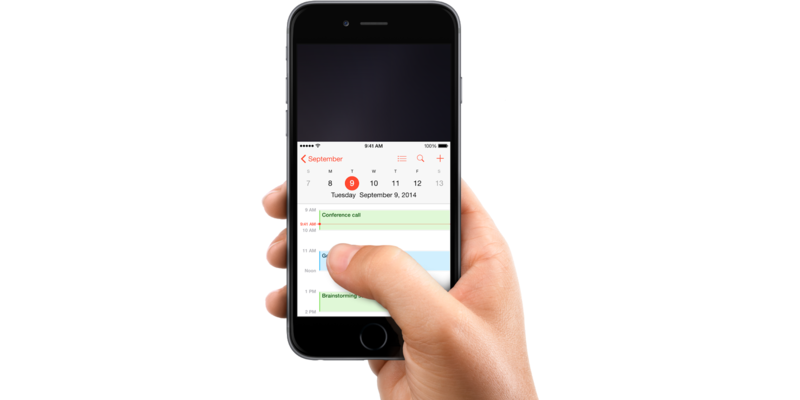 Apple has even considered the reachability of the UI on the larger iPhone display. Simply double touch the Home button and the entire screen shifts down closer to your thumb. And to easily navigate Safari or Mail, swipe left to right across the screen to go backward, or swipe right to left to go forward. With the new continuous surface of iPhone, all your gestures now feel smoother than ever. The 16GB version of the iPhone 6 Plus will cost $299 on a 2-year contract, while the 64GB and 128GB versions will go for $399 and $499, respectively. Apple will replace the 32GB slot with a 64GB version, and is also making a 128GB model available for the first time. Pre-orders start September 12th and units will start shipping out of Apple's warehouses a week later, on September 19th. The first batch of iPhone 6s will sell in the USA, Canada, the UK, France, Germany, Australia, Hong Kong, Singapore, and Japan. By the end of 2014, some 115 countries worldwide will have access to the iPhone 6.